Top : Designers : Arthur D. Darden, Inc.
Arthur D. Darden, Incorporated is the oldest naval architecture and marine engineering firm in New Orleans, and the successor to the original proprietorship established in 1955. Over the past fifty plus years more than 2,000 projects have been undertaken covering a wide range of subjects in the fields of Naval Architecture and Marine Engineering. 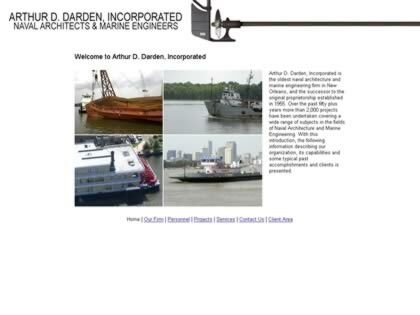 Web Site Snapshot: If available, above is a snapshot of the Arthur D. Darden, Inc. web site at http://www.arthurdardeninc.com as it appeared when this site was added to the directory or last verified. Please Note that Boat Design Net has no involvement with the above web site; all content and images depicted in the above thumbnail are the property and copyright of Arthur D. Darden, Inc. unless otherwise noted on that site. Description: Arthur D. Darden, Incorporated is the oldest naval architecture and marine engineering firm in New Orleans, and the successor to the original proprietorship established in 1955. Over the past fifty plus years more than 2,000 projects have been undertaken covering a wide range of subjects in the fields of Naval Architecture and Marine Engineering. Visit Arthur D. Darden, Inc.